Actin is a major component of the cytoskeleton and is present in most cell types. Actin is a major component of the cytoskeleton and is present in most cell types. It is highly specific to actin from smooth muscles. 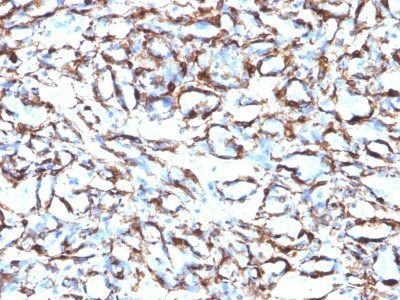 This MAb does not stain cardiac or skeletal muscle; however, it does stain myofibroblasts and myoepithelial cells. 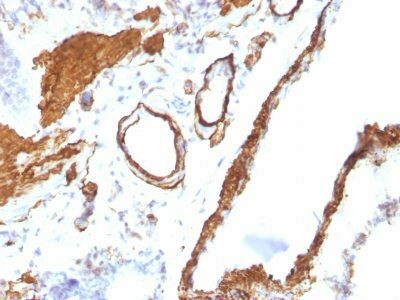 This antibody could be used together with anti-muscle specific actin and myogenin in making a diagnosis of smooth muscle and skeletal muscle tumors. In most cases of rhabdomyosarcoma, this antibody yields negative results whereas anti-muscle specific actin and myogenin are positive. 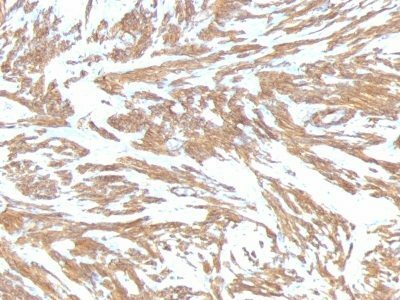 Leiomyosarcomas are positive only with anti-muscle specific actin and anti-smooth muscle actin and are negative with anti-myogenin. 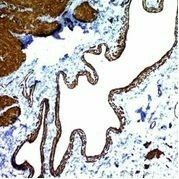 Catalog number key for antibody number 0791, Anti-Smooth Muscle Actin (ACTA2/791) The prefix indicates conjugation, followed by the antibody number and size suffix.